The 16th match of the 2019 IPL will see Delhi Capitals, formerly Delhi Daredevils, take on Sunrisers Hyderabad. Till date, these two sides have met 12 times in the IPL with SRH leading the Capitals 8-4. In 2018 IPL it was SRH who came on top in both the encounters against the Delhi side. The longest winning streak in matches between these two teams is four. SRH won four consecutive matches against Delhi between IPL 2013 & 2014. No player has won more than one Player of the Match award in matches between these two teams. Amit Mishra, Ashish Nehra, David Warner, Irfan Pathan, Naman Ojha, Siddarth Kaul, Vijay Shankar & Yuvraj Singh have played for both these sides. On that note, let us now take a look at some of the key stats from DC vs SRH matches in the past. 191 scored by SRH in IPL 2017 & again in IPL 2018 is the highest team total in Delhi Capitals vs Sunrisers Hyderabad matches. 80 all out by Delhi in IPL 2013 is the lowest team total in matches between the two sides. 357 runs scored by Shikhar Dhawan of SRH is the highest number of runs scored by a player in matches between the two sides. 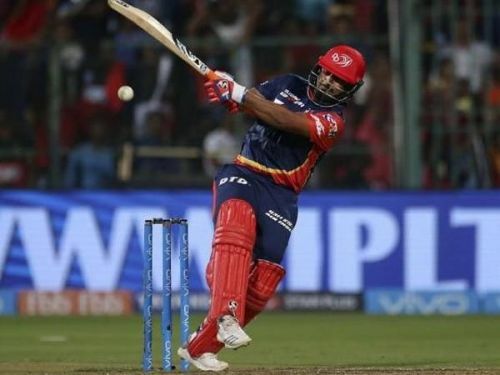 128* by Rishabh Pant of Delhi in 2018 IPL is the highest individual score in matches between these two teams. He is also the only player to score a century in these fixtures. 17 half-centuries have been scored in matches between these two sides. 2 half-centuries hit by David Warner (SRH), Kane Williamson (SRH), Shikhar Dhawan (SRH) & Shreyas Iyer (Delhi Capitals) each is the highest number of half-centuries hit by a player in these fixtures. 124 sixes have been hit in matches between these two sides. 11 sixes hit by Rishabh Pant & Shreyas Iyer is the highest number of sixes hit by a player in these fixtures. 42 fours hit by Shikhar Dhawan is the highest number of fours hit by a player in these fixtures. 9 wickets taken by Dale Steyn of SRH & Amit Mishra (5 playing for Delhi & 4 playing for SRH) is the highest number of wickets by a player in these fixtures. 4/17 by JP Duminy of Delhi in IPL 2015 is the best bowling performance by a player in matches between these two teams. 6 catches taken by David Warner playing for SRH is the highest number of catches taken by a player in matches between these two teams.